CADILLAC BILL is a long stemmed Texan weed from England. Creeping bent grass is also a long stemmed weed than grows throughout this planet. Together, they form a delightful blend of psycho surf and garage rock ‘a’ Billy—oozing together, ala The Cramps and The B-52’s. The high energy and circus like stage show includes 18 feet of purple and red glittery backdrop, a 9 foot chrome Cadillac emblem, 2 bubble machines, flash pods, fire, lights, smoke and action! Sometime back in the last century, Bill moved to Canada from England. He studied film at the U.C.L.A. and animation at Sheridan College. is first band was named THE EDNA, MONA HOUSEWIFE DEATH BAND and lasted a creative but uneventful few years as Bill pursued his filmmaking years. In the late 80’s, Bill moved in with an up and coming band called THE COWBOY JUNKIES and it was at this time that he put aside filmmaking to tell stories via music. In the dingy Junkies practice space and with upset neighbors complaining about the noise; THE CREEPING BENT soon sprouted and by 1990 had bloomed, flowerlessly into the long twisted weed that it now is. 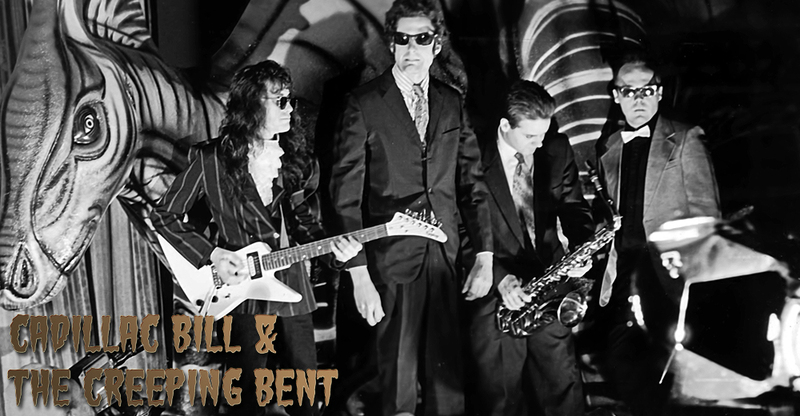 In the ensuing years, CADILLAC BILL & THE CREEPING BENT has toured Canada many times, opening for such acts as THE HEADSTONES, WILD STRAWBERRIES, BIG SUGAR, THE TUBES, RAY CONDO, TEENAGE HEAD, DREAD ZEPPELIN, THE GRUESOMES, WEEN and JUNKHOUSE. C.B. & THE BENT were quarter finalists in the North by Northeast Internet Battle for the Bands and semi-finalists in CFNY’s Canadian Music Search. They also performed for the COCA National Showcase, resulting in many nationwide University shows. The Cadillac Bill experience has now become a polished stage show of talented and eccentric characters, creating one of the most enjoyable live fiascos … as the Creeping Bent continues to strangle all the other flowers in the flowerbed of live music.